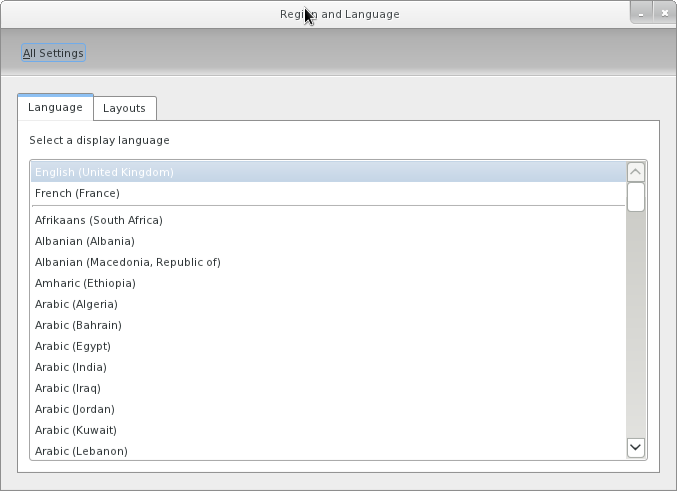 Yesterday, I finished working on a UI cleanup for the “Region and Language” panel in the control-center. You can see the results below. I'm pretty happy with this, though quite a bit of work could still be done, like allowing users to install “language packs” (fonts, translations, dictionaries) from the language tab, or integrating input sources in the layouts tab. You are using tabs for two items: 'language' and 'layout', yet, there's that huge area on the top with one navigation item that goes back to 'All Settings'. Why not a toggle button group for those two on the same area as the navigation, centered? Can we have bigger screenshots? Jan: the "all settings" is the control-center shell's toolbar, we don't control that. Anonymous: Blogger seems to be crapping it up. Updated with bigger pictures. The artifacts are my graphics driver's fault. - It'd be useful if there's no keyboard plugged in (tablet), or if the keyboard isn't paired yet (bluetooth keyboard, gdm login screen or even cryptoroot password input). The virtual keyboard would be optional/on-demand if there's a physical keyboard. - If there's a text input field, the keyboard appears, while making sure the focused input field doesn't get covered. - language and dictionaries can be switched on the virtual keyboard, and layouts (qwerty, azerty, kana) would reflect the chosen language. - it'd be nice if text input with mixed languages/dictionaries would be possible. I don't think it's uncommon for people to write a text in multiple languages. Either that or make it really easy to change language/dictionary while typing. * options are global instead of local to the layout. What does "Layout" mean? Does it mean "Keyboard Layout"? If so, shouldn't the text be changed to this? Hmm, the word "keyboard" doesn't even appear once on that screenshot! Maybe, but perhaps something it can be communicated back to the control center people that it's an awful piece of design. Nearly 50 vertical pixels wasted on a tiny piece of text, when we have other designers desperately trying for compact layouts that will fit on a small screen.